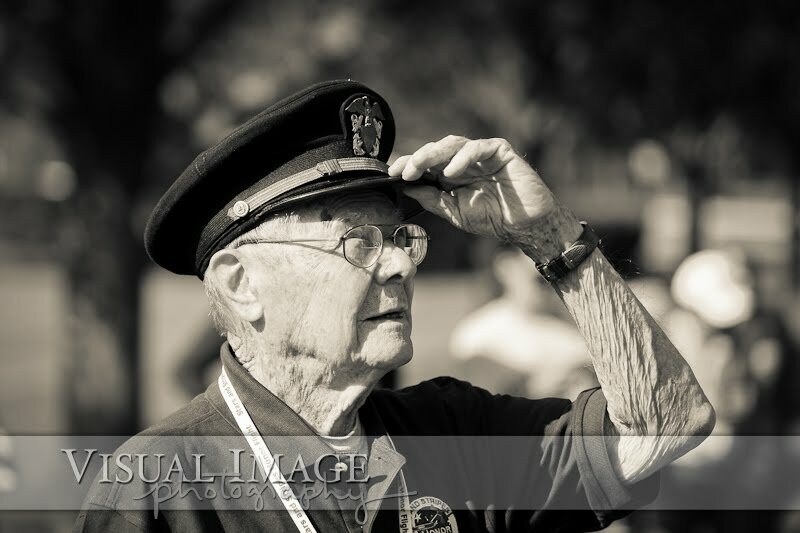 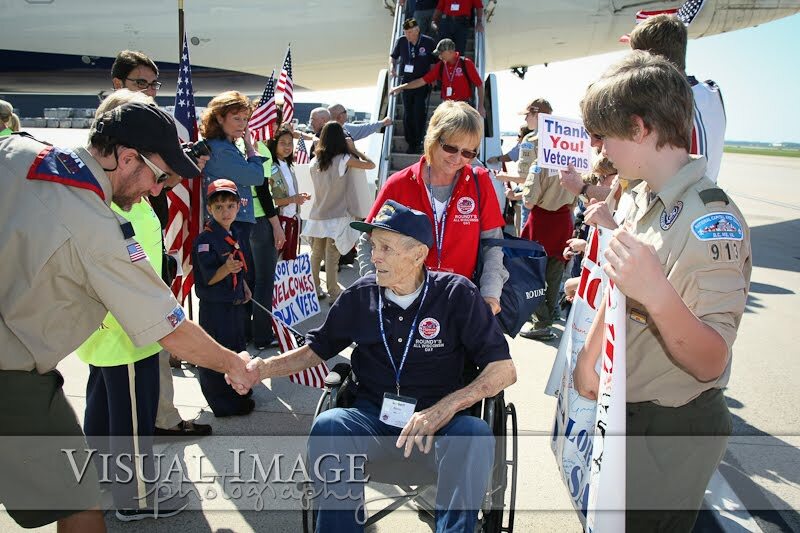 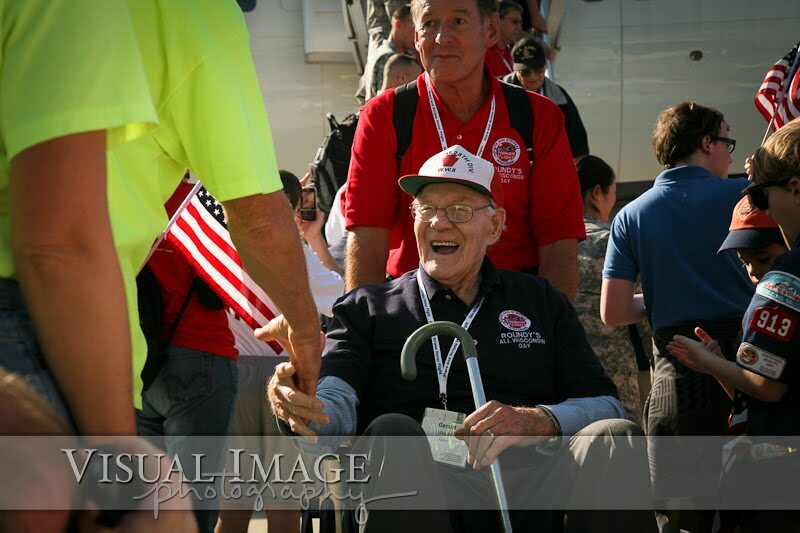 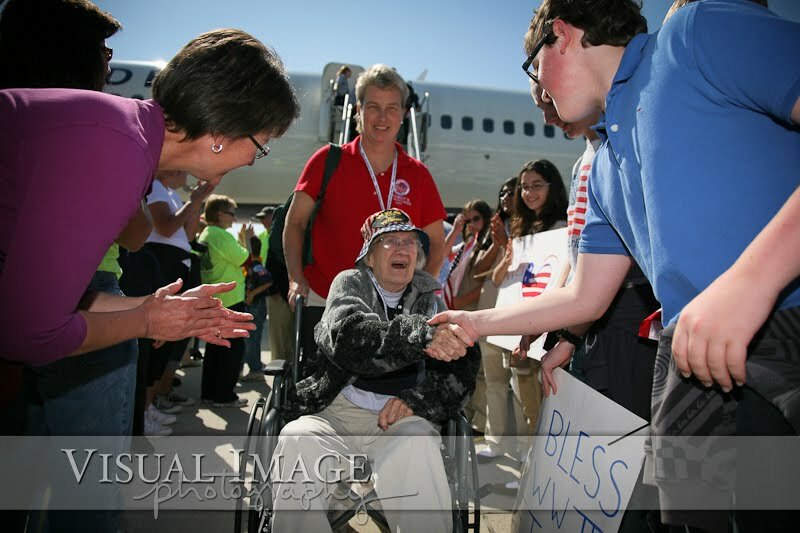 On October 8, 2011, the Stars and Stripes Honor Flight organization flew two planes of World War II veterans from Milwaukee to Washington, DC. 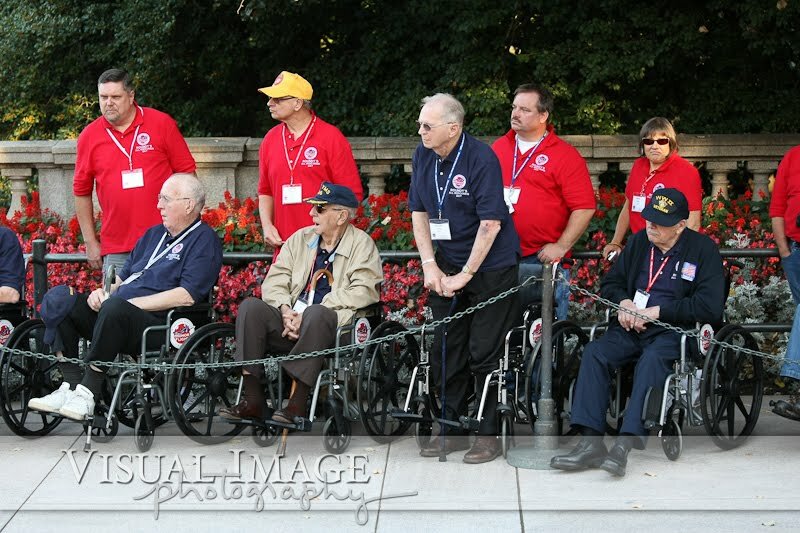 These heroes were able to visit the WWII memorial, the Iwo Jima Memorial, and Arlington National Cemetery. 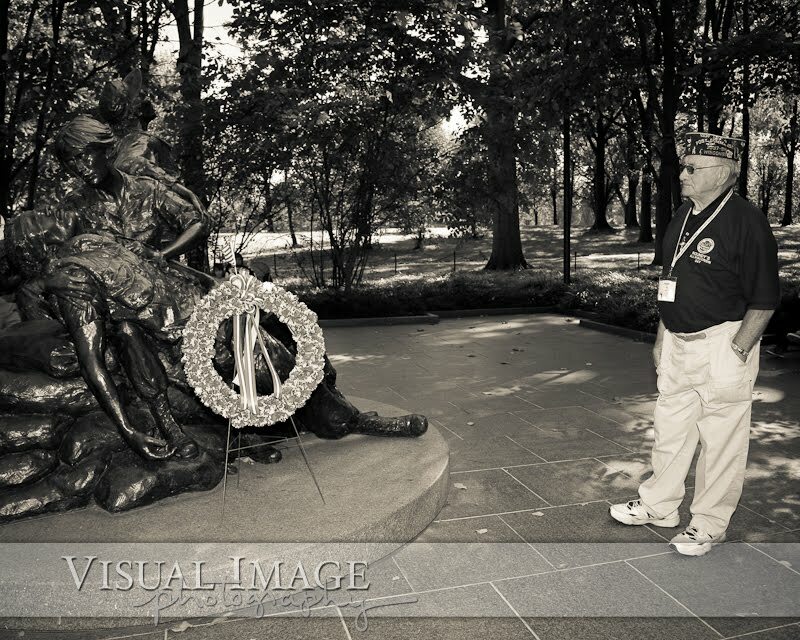 The Alpha group was also able to visit the Vietnam Memorial and the Korean War Memorial. 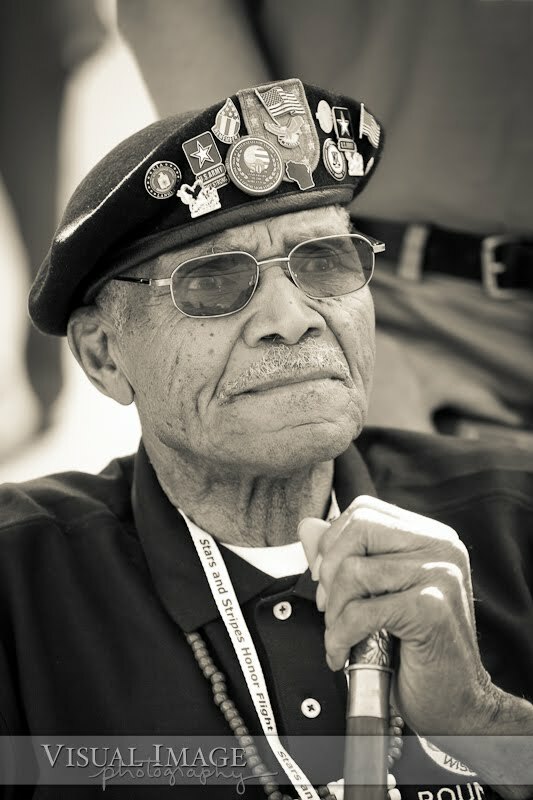 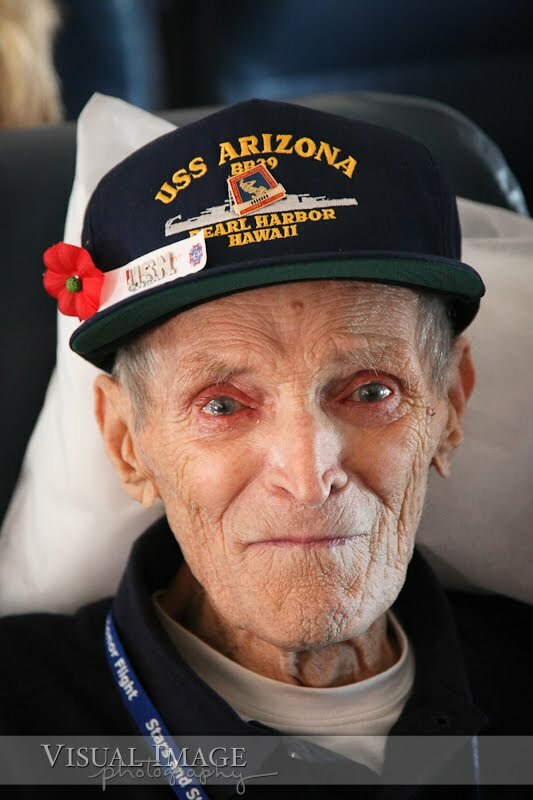 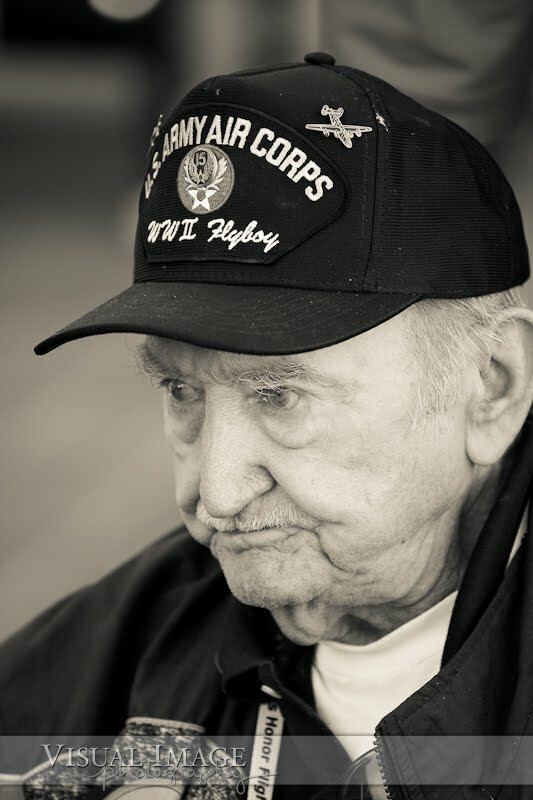 Each veteran flies for free. 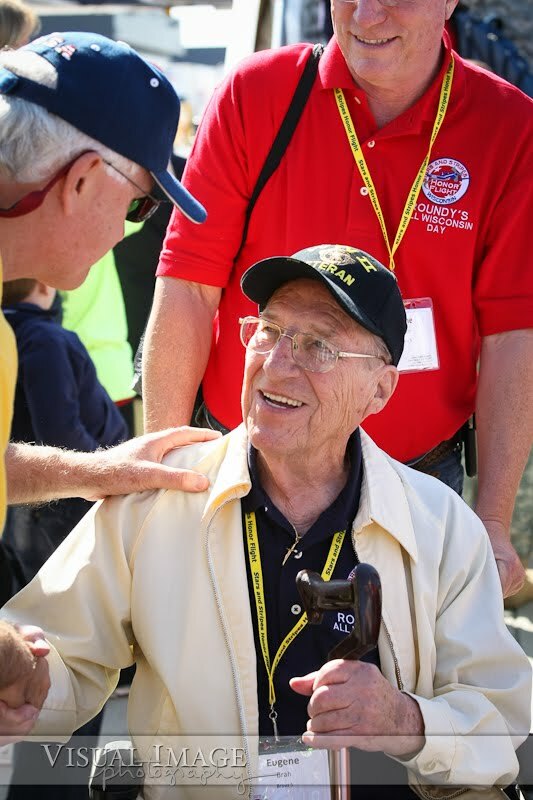 To learn more about this amazing organization and how you can help--either by donations to make the trip possible, becoming part of the support staff, or how you can become a guardian--visit their website by clicking here. 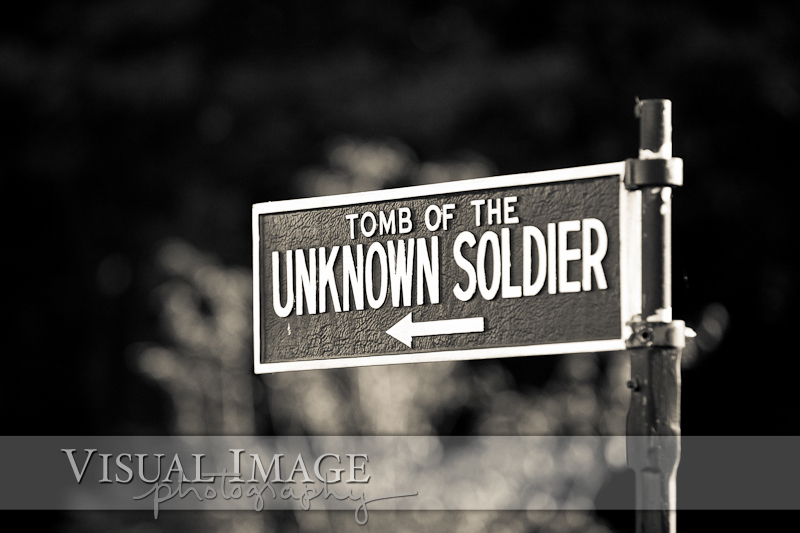 Or you can like them on Facebook by clicking here. 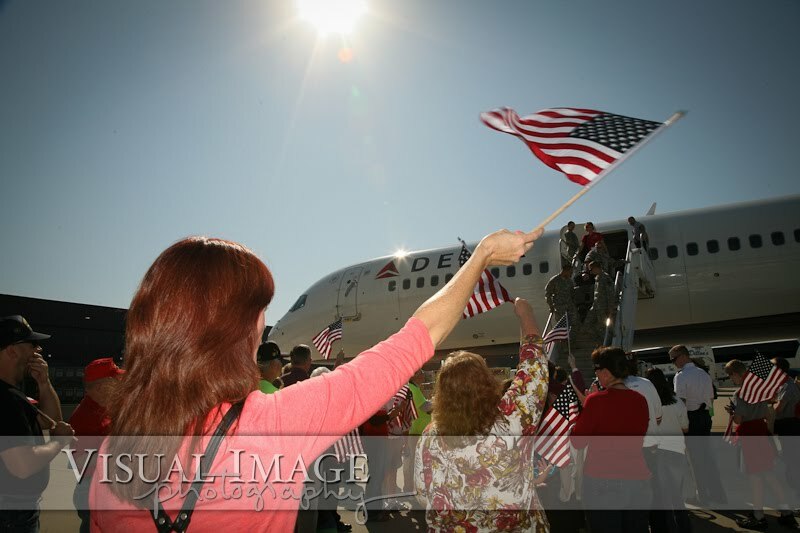 The weather was perfect, the sun was shining, and a huge crowd greeted the veterans as they landed at Dulles International Airport. 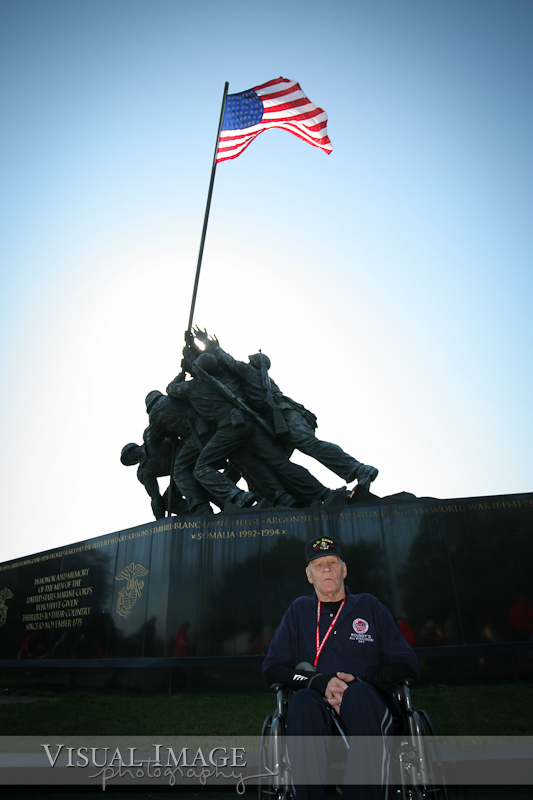 Courtney Lutz traveled with the Alpha group, and Karl Boettcher traveled with the Bravo group as 10 buses took us around Washington, DC. 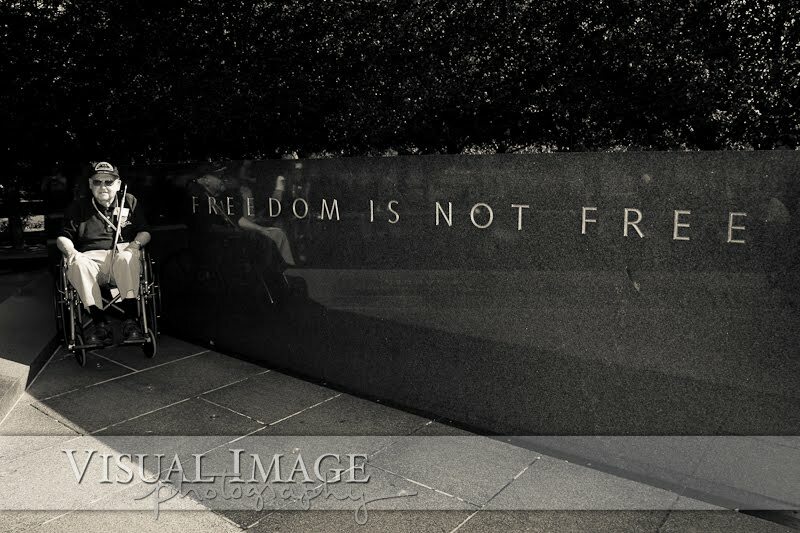 We will have all the images posted online for you to view and download very quickly, but until then, please enjoy this series of blog posts with images from the trip. 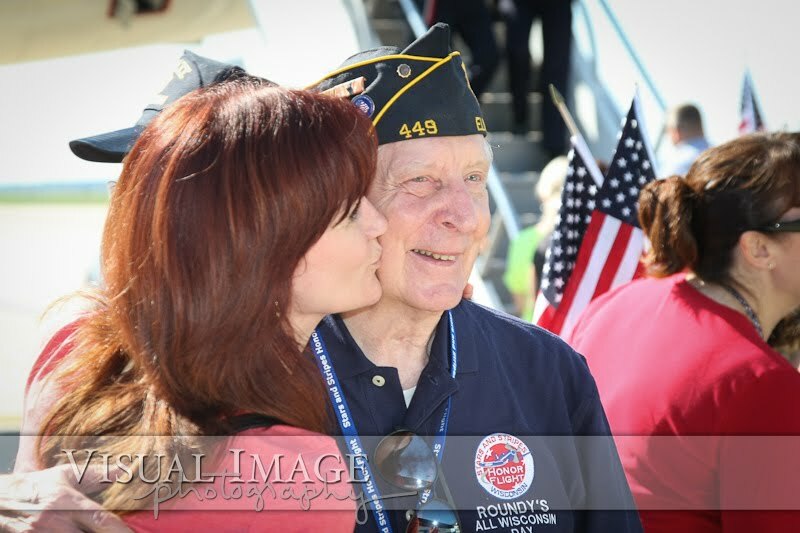 To view photos of the mail call and homecoming celebration, click here.There are so many amazing stories from so many amazing people during this trip. 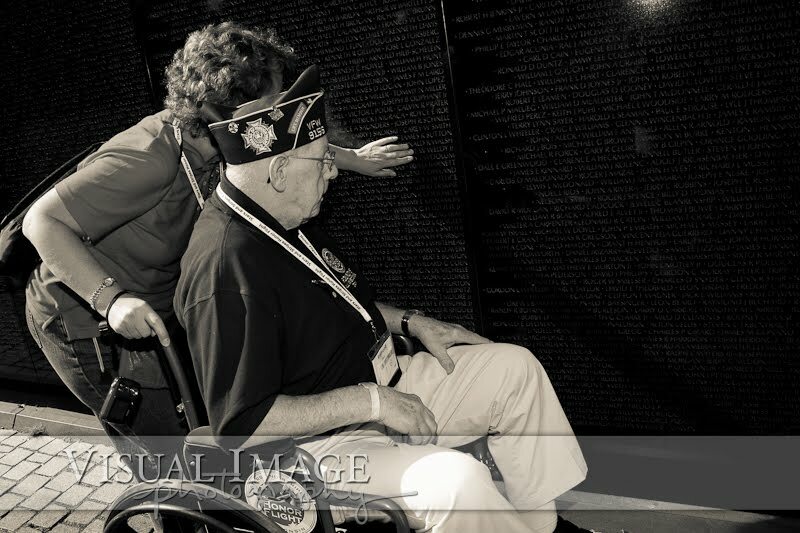 I've added some comments throughout the photos, but my words don't do justice for what these heroes lived through. 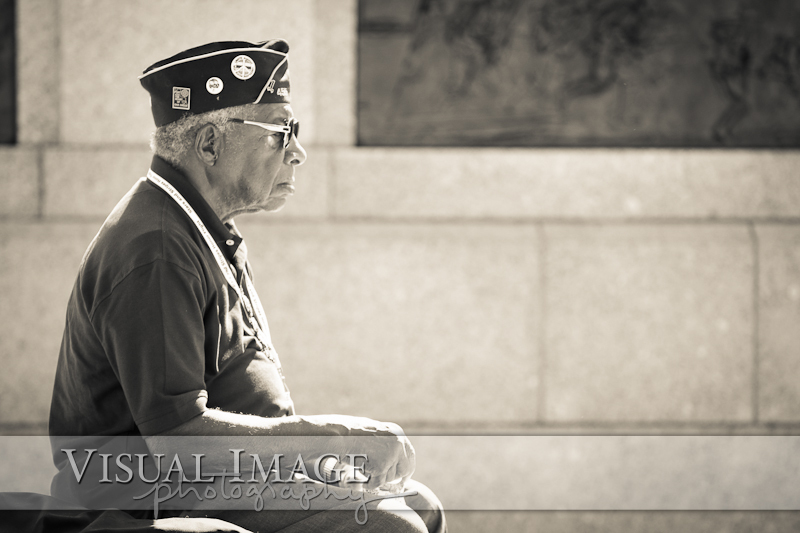 All I can do is ask that if you know a veteran, take the time to listen. 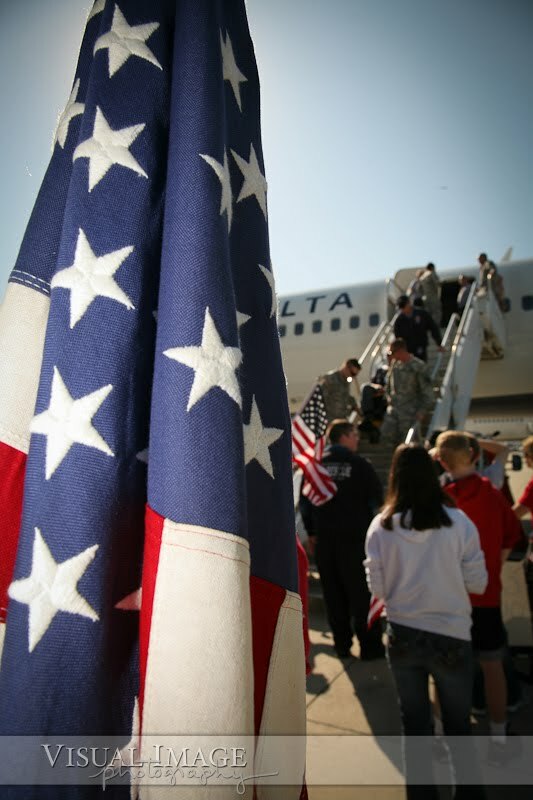 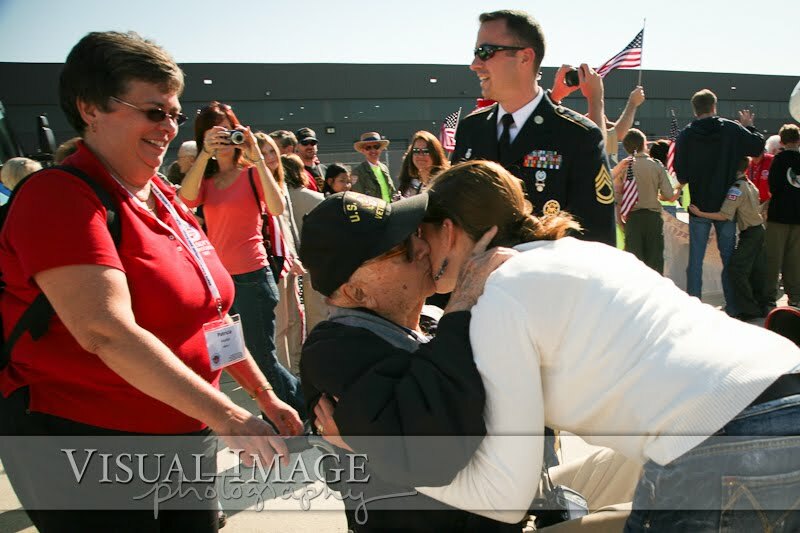 The day began with a surprise for the veterans as they entered the gate at the airport. 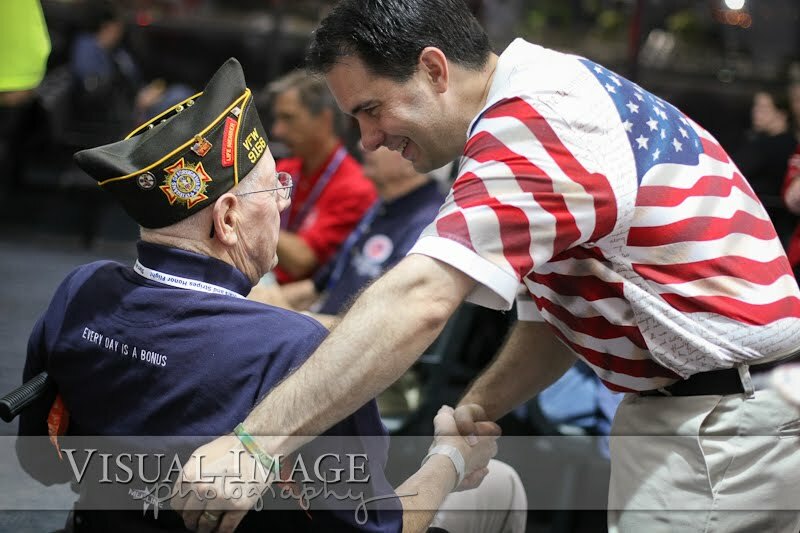 Unbeknownst to them, Governor Scott Walker was there to personally greet every single veteran before they left that morning on the Stars and Stripes Honor Flight. 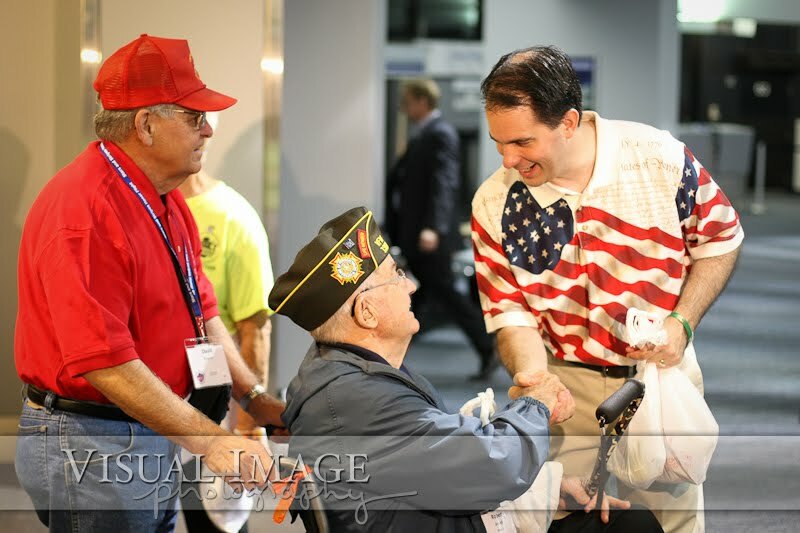 Governor Scott Walker greets a veteran on his way to the terminal. 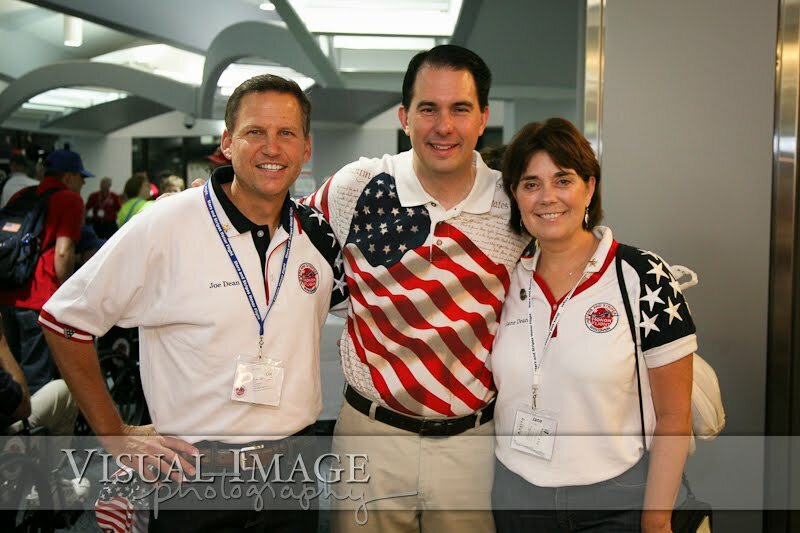 Governor Scott Walker with Joe and Jane Dean. 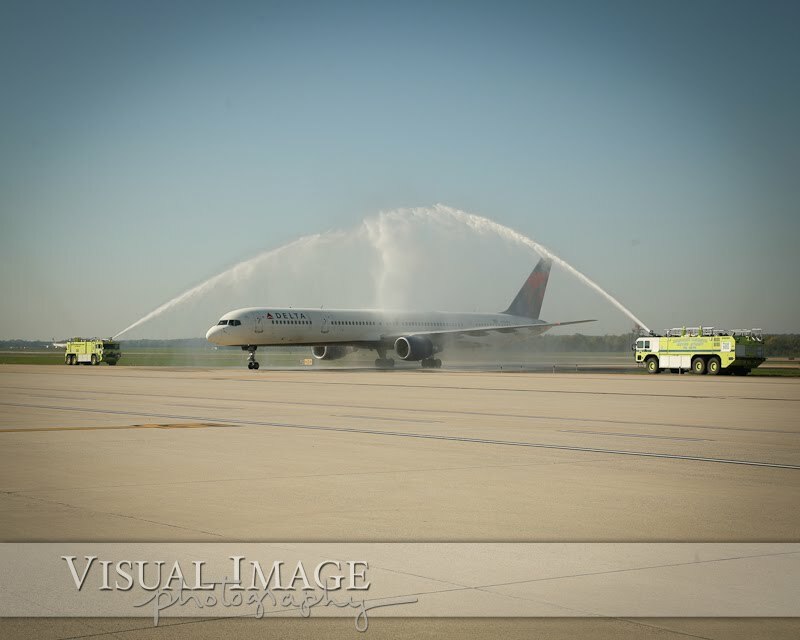 A water cannon salute greets each plane as it lands at Dulles International Airport. 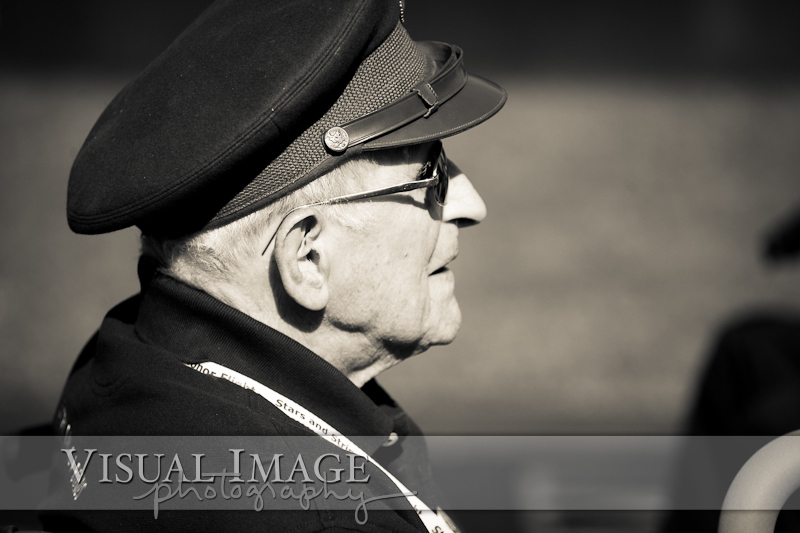 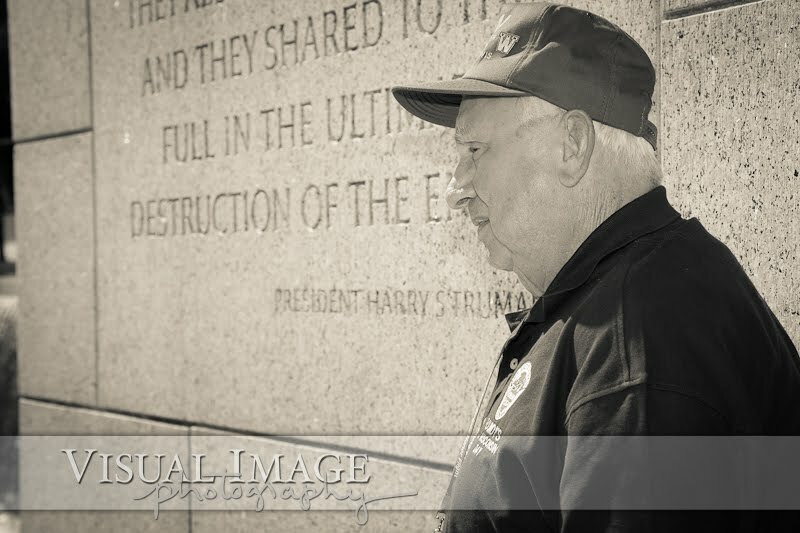 Joe Dean leads the veterans in a prayer at the WWII Memorial. 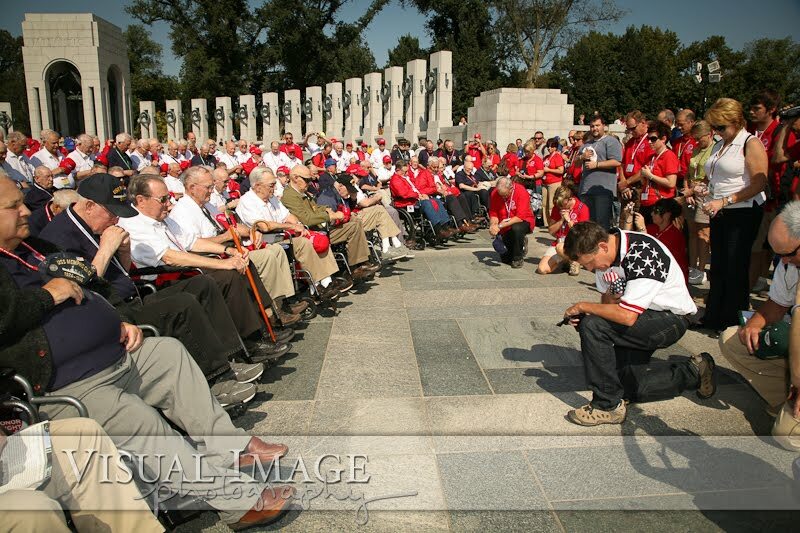 Over 400,000 American military personnel lost their lives during WWII. 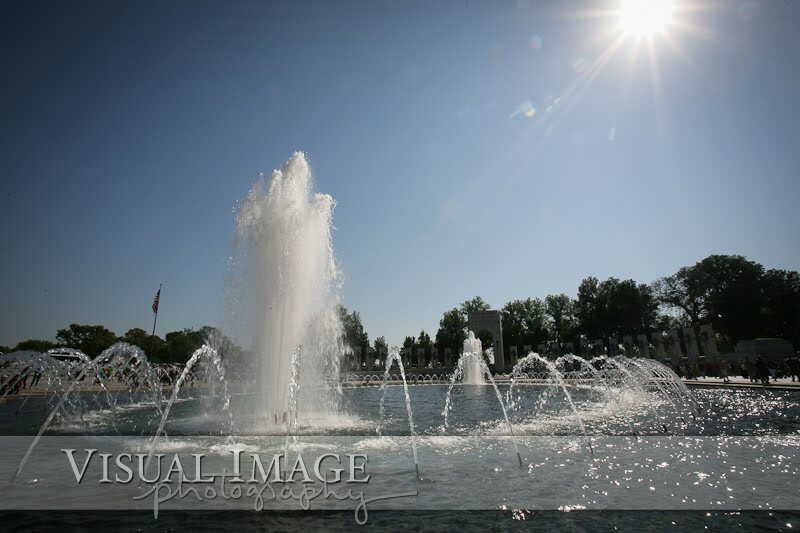 Each star represents 100 American military deaths. 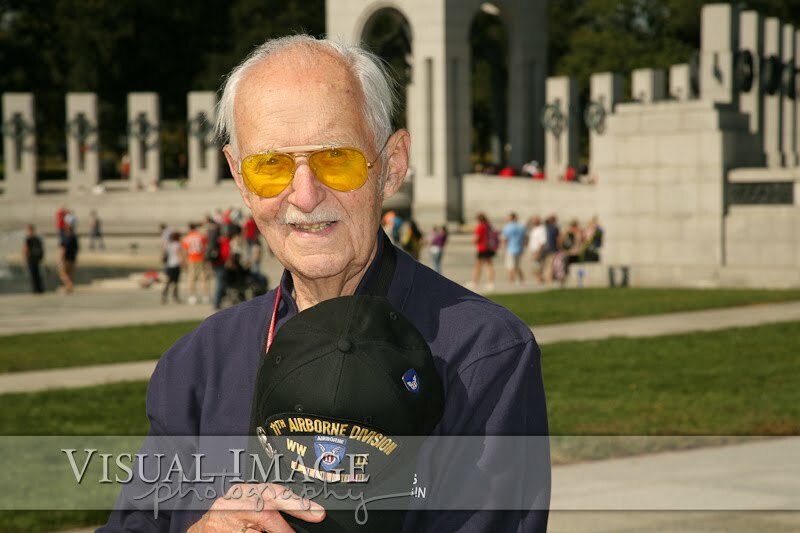 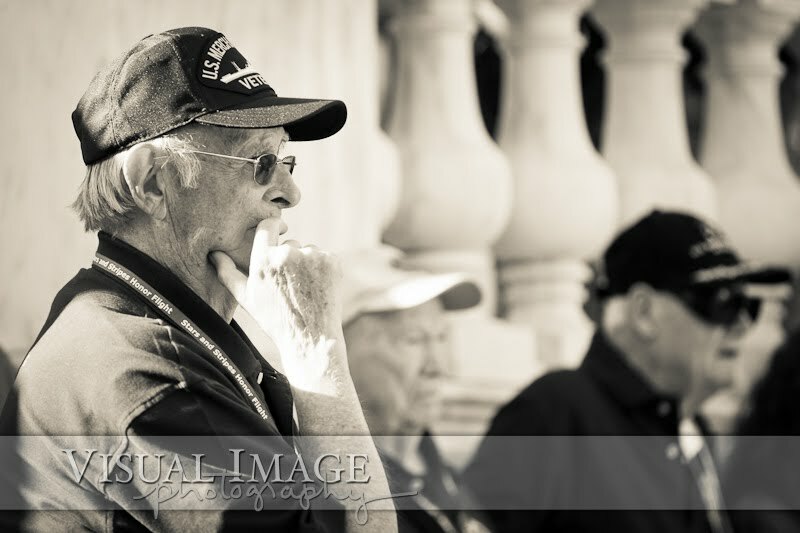 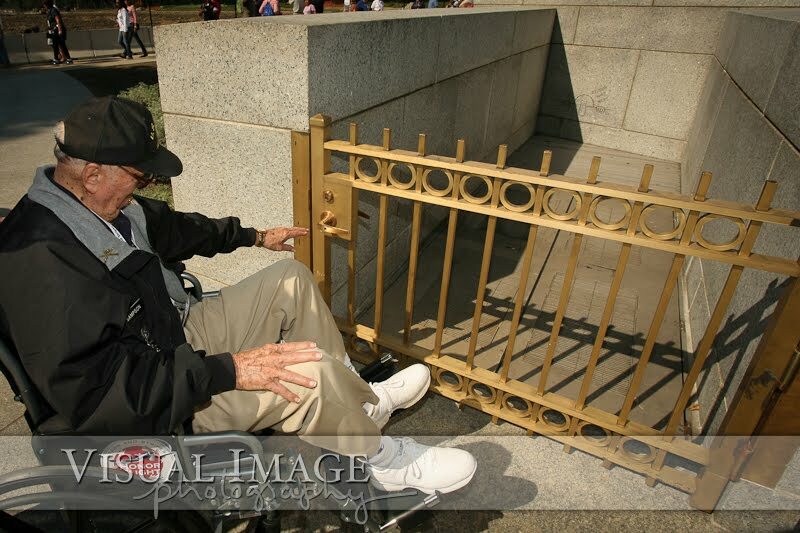 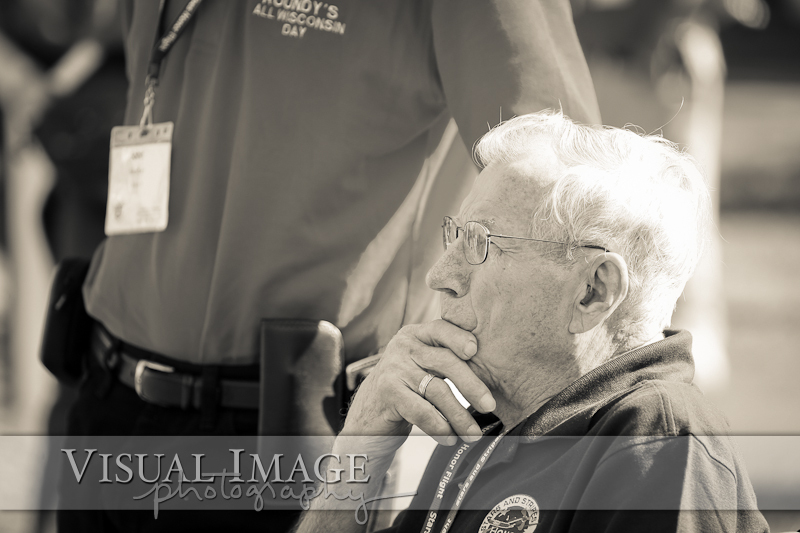 One of the veterans found Kilroy at the WWII Memorial. 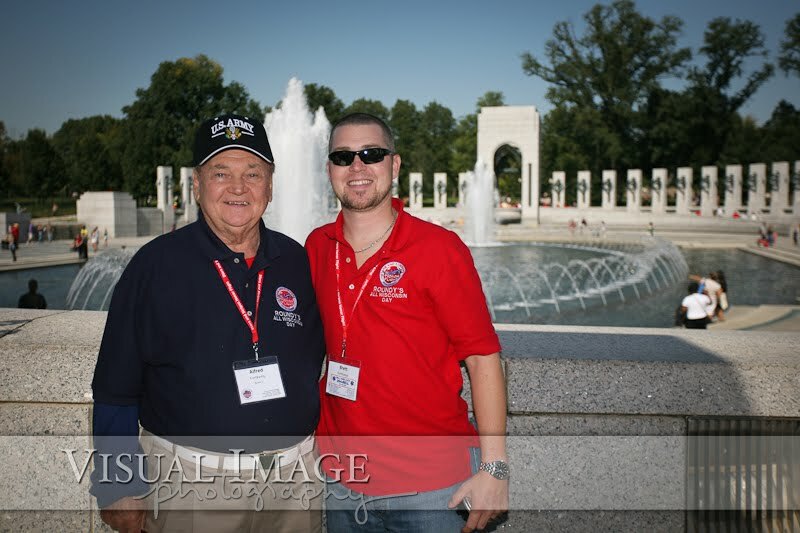 Al Fortkamp with his grandson and guardian Brett. 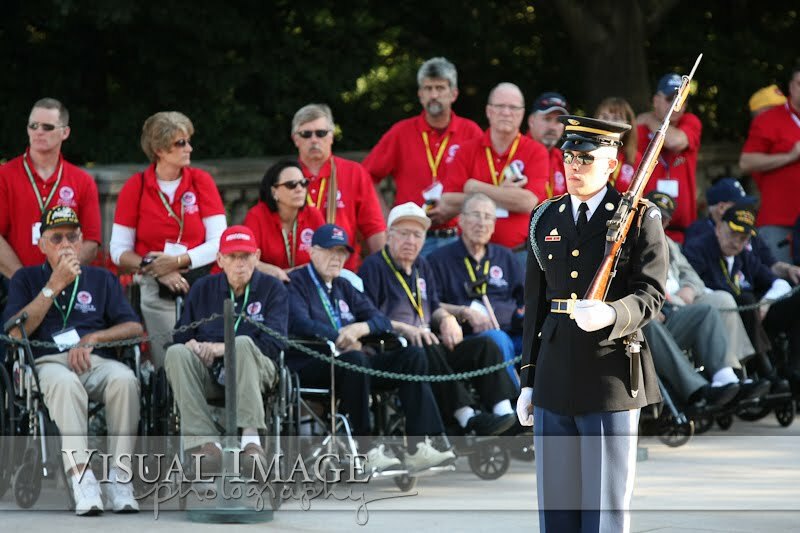 I was amazed and humbled by the amount of family members who accompanied their fathers on this trip. 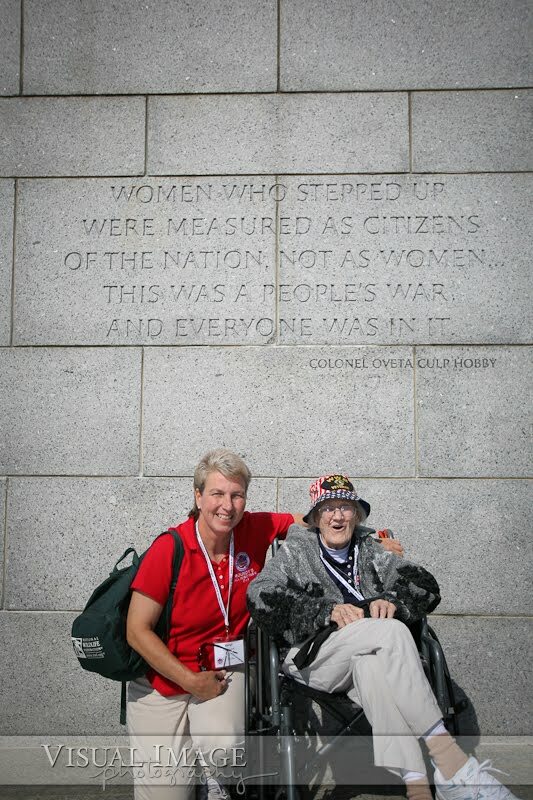 And I also had the pleasure of spending the day with a daughter, Keryl, who traveled with her mother, a WWII veteran, on this trip. 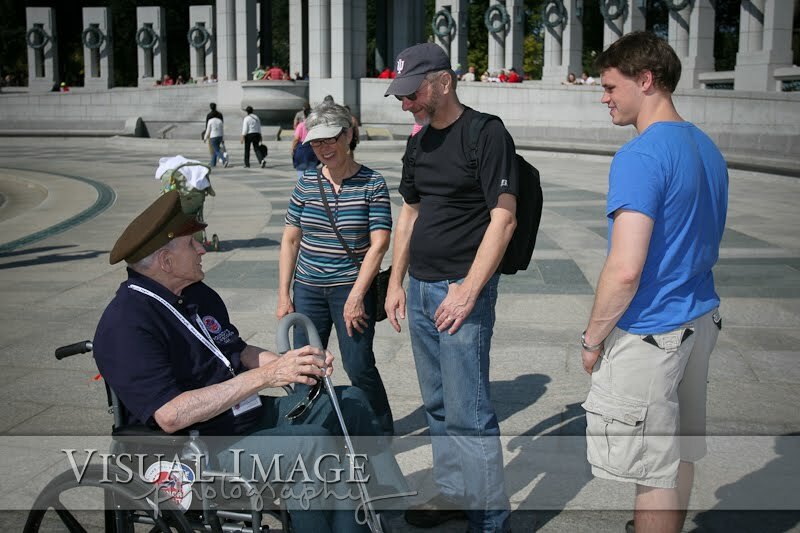 One veteran talks with visitors at the memorial. 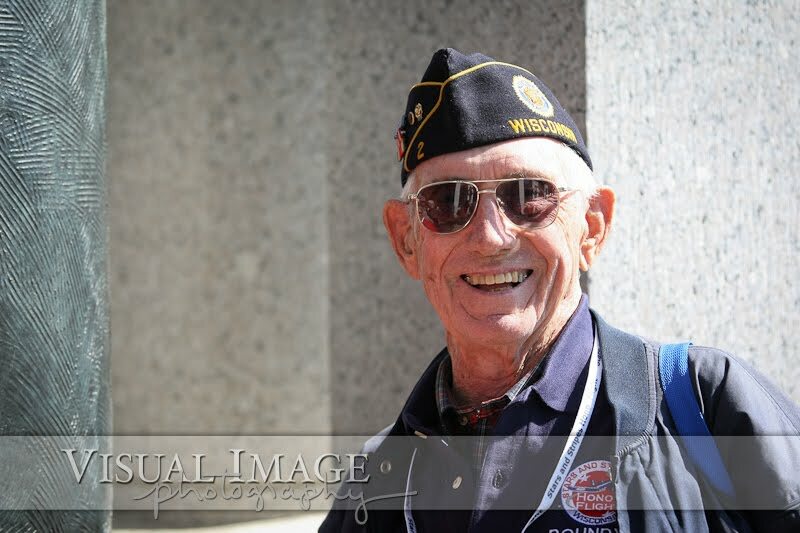 Even though these people were just visiting Washington, DC on their own, everyone I met took the time to express their gratitude for the service of the veterans from Wisconsin. 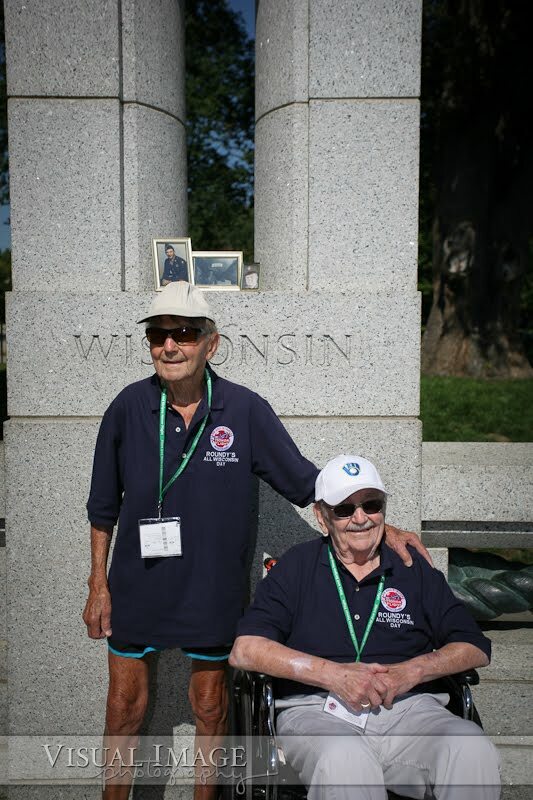 Brothers who served during WWII. 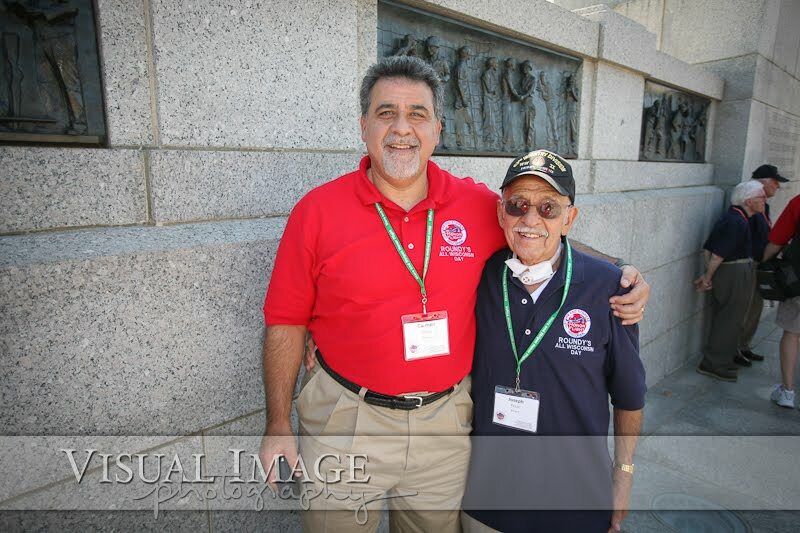 While one brother was in Europe, the other was serving in North Africa. 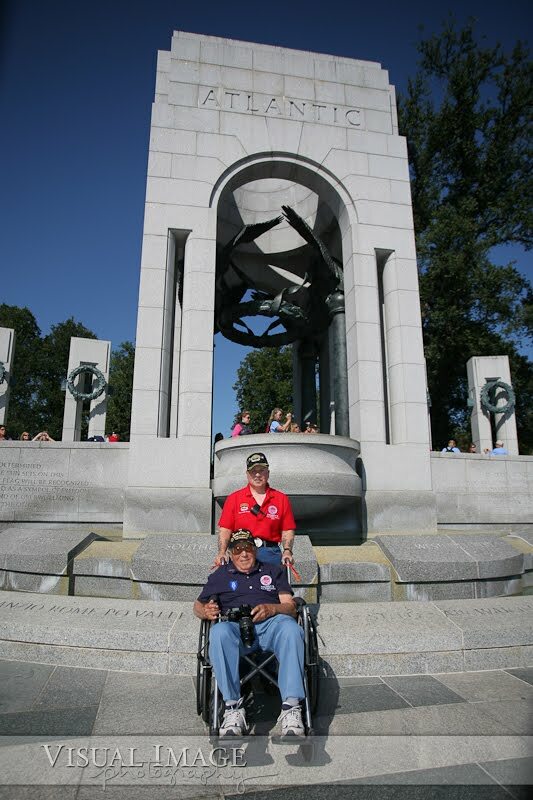 Keryl and Wanda Frankowski at the WWII Memorial. 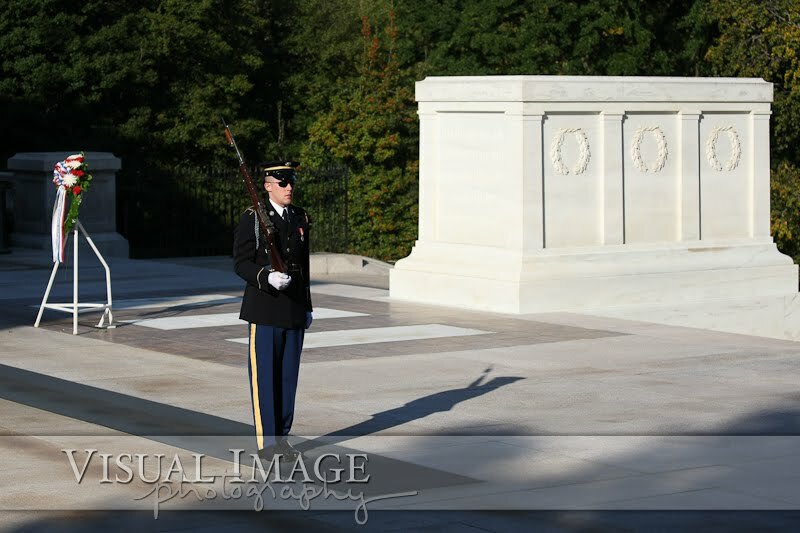 During the changing of the guard at the Tomb of the Unknown Soldier, visitors are asked to stand and remain silent. 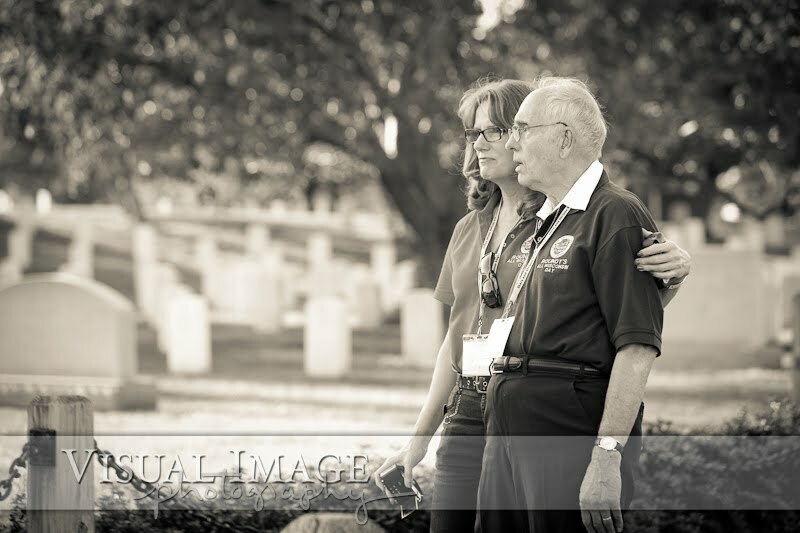 Our stop at Arlington National Cemetery to observe this ceremony was the last event of a very long day. 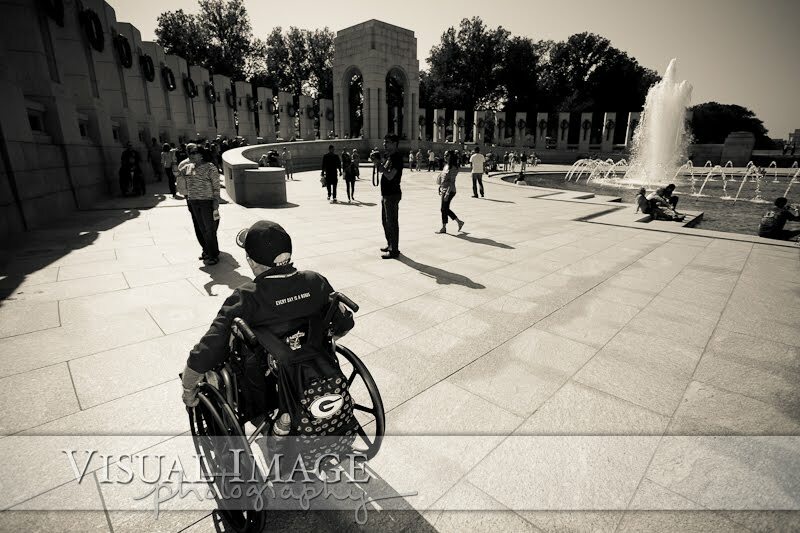 While not everyone who fought for freedom was able to stand during the ceremony, I was moved to see the strength one of our heroes summoned. 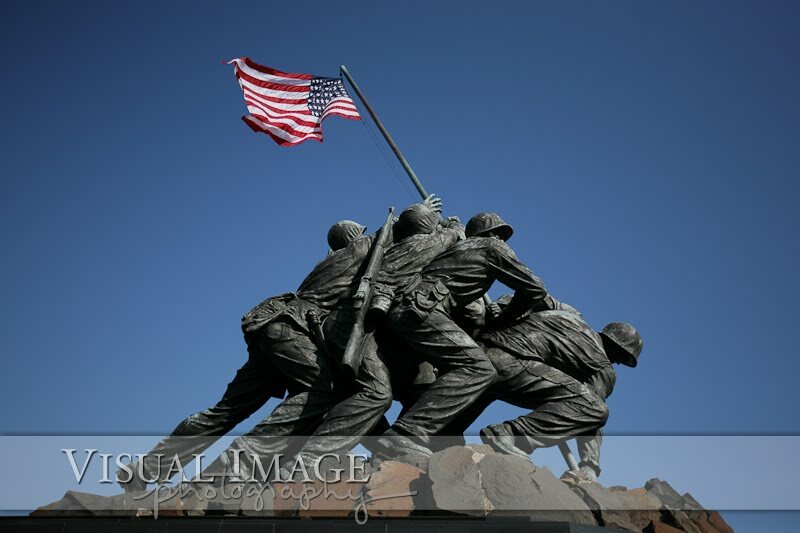 After everything we did on this day, here was one more reminder of how strong these heroes are. 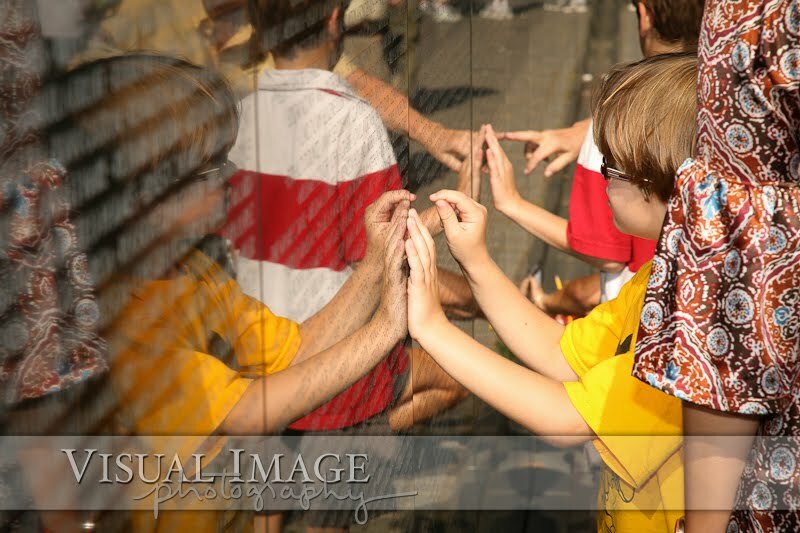 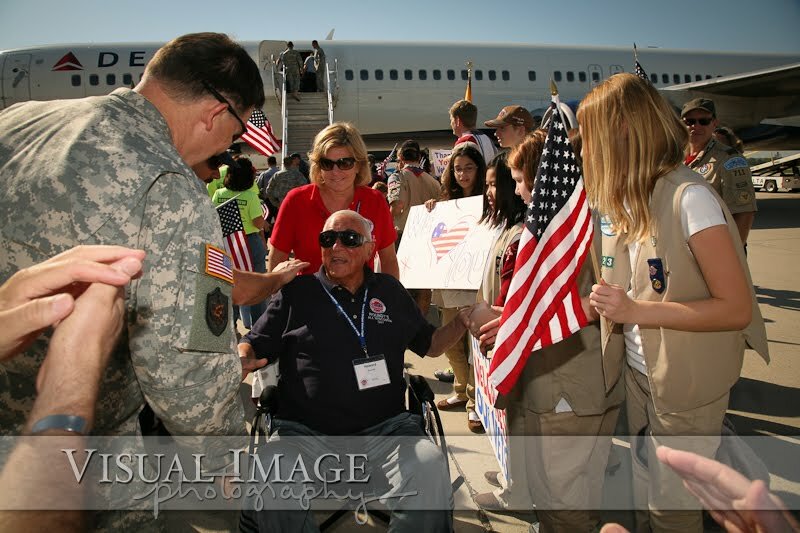 Would you like to see images from previous Stars and Stripes Honor Flights? 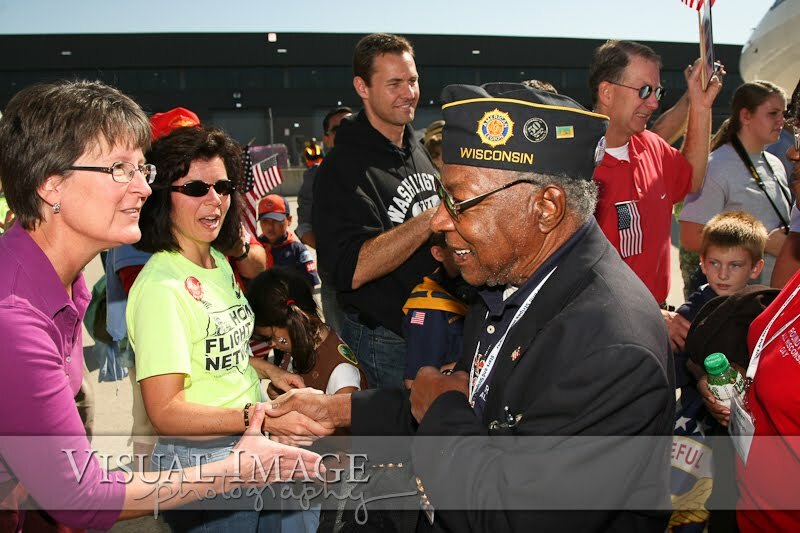 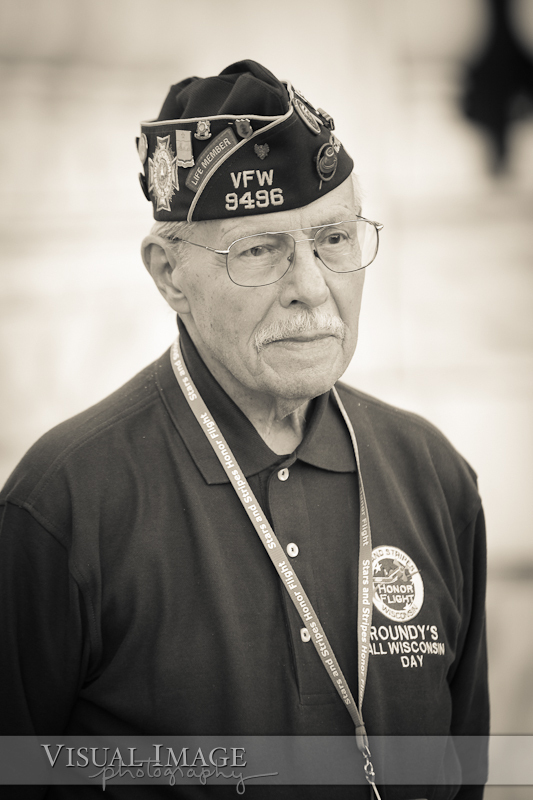 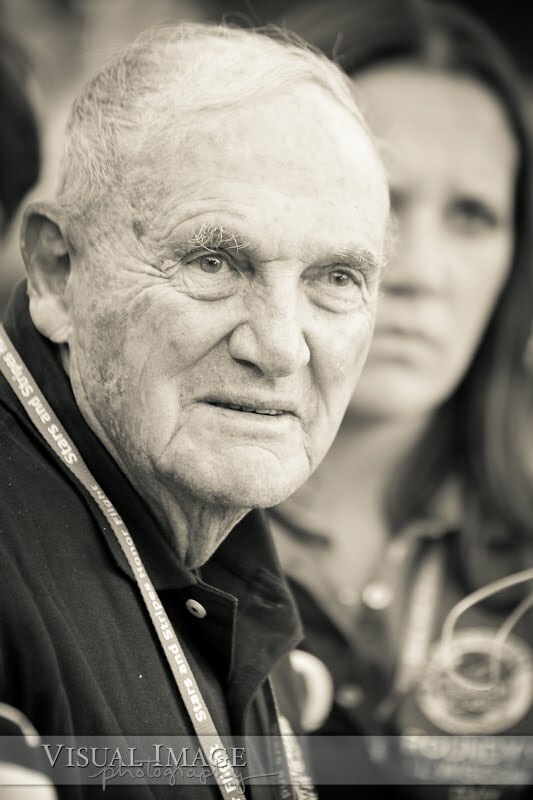 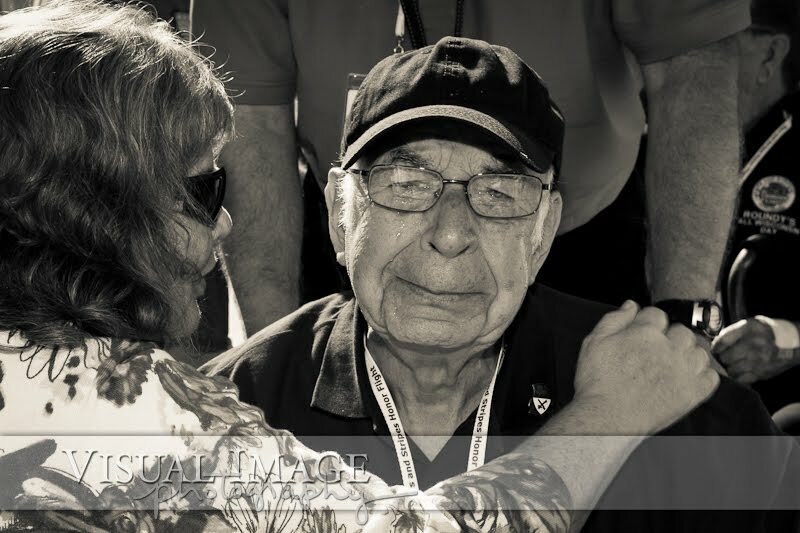 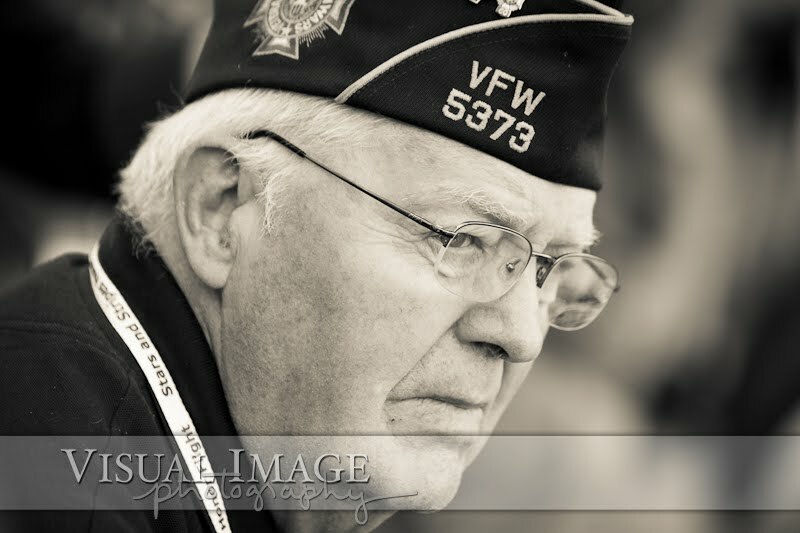 Click here for the May 2011 Honor Flight. 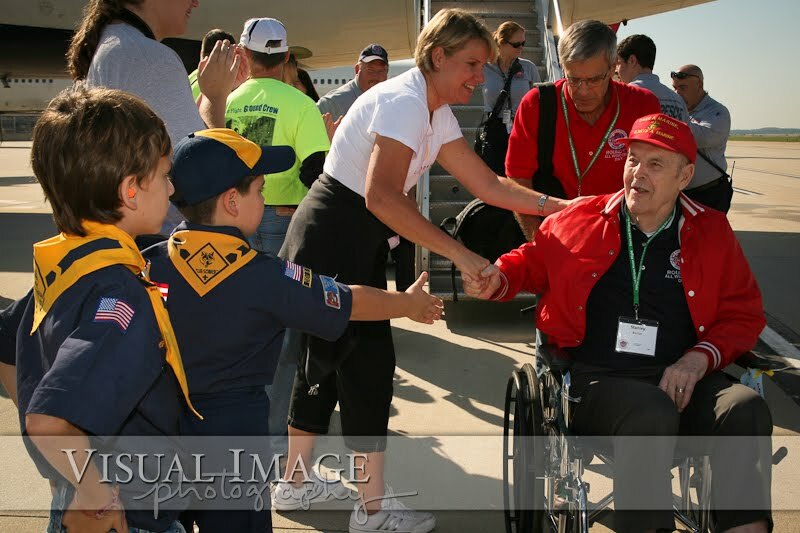 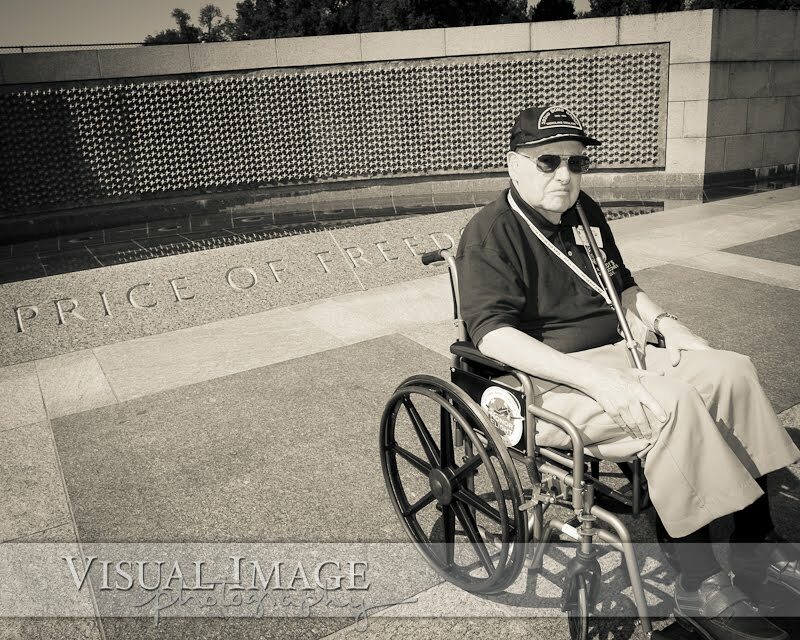 Click here for the April 2011 Honor Flight. 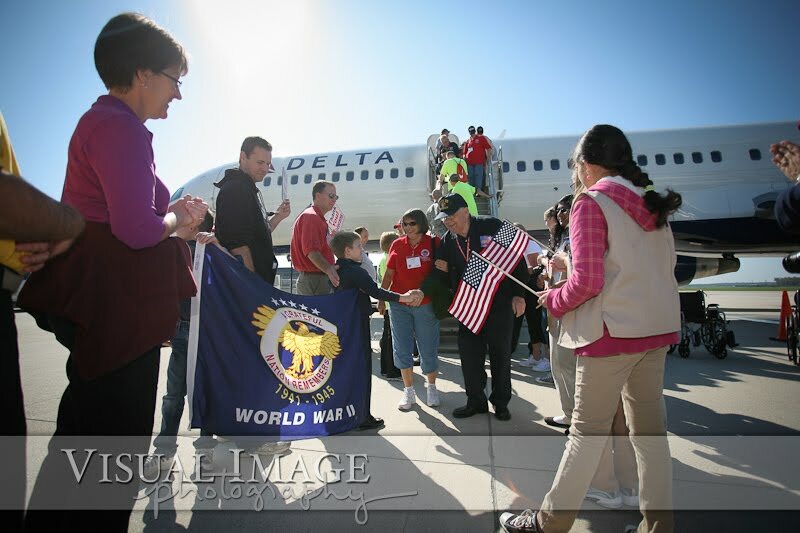 Click here for the November 2010 Honor Flight. 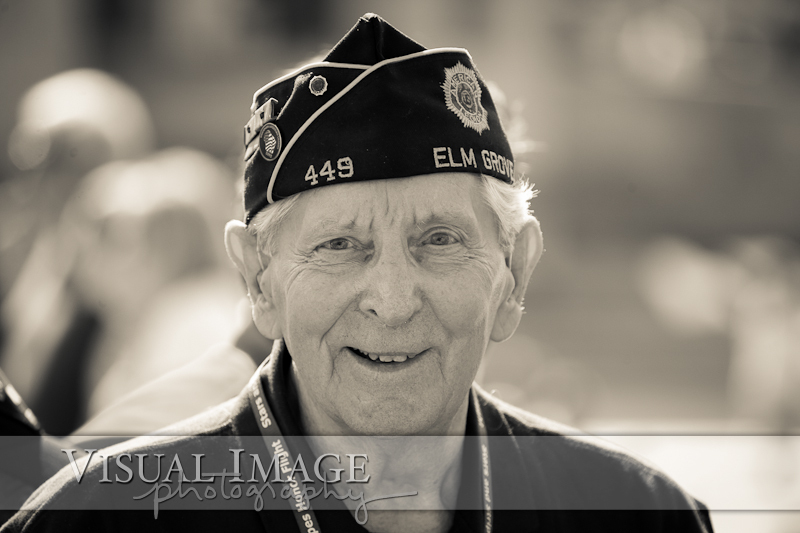 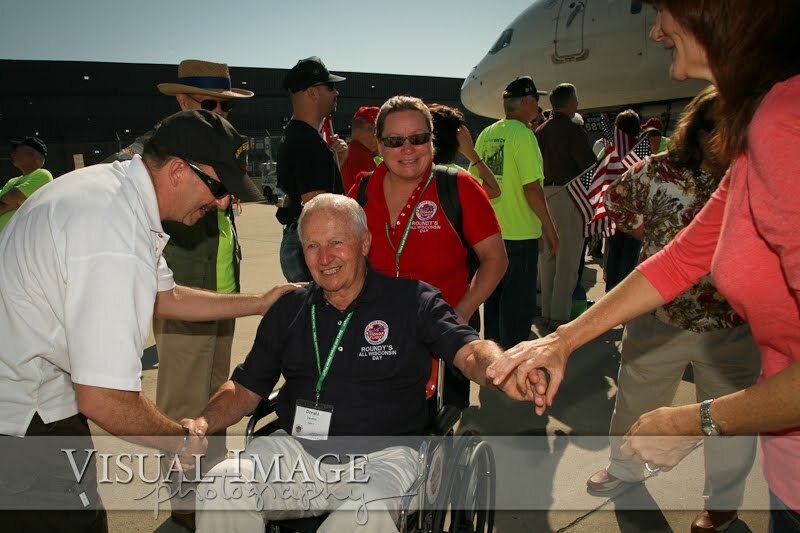 Click here for the September 2010 Honor Flight. 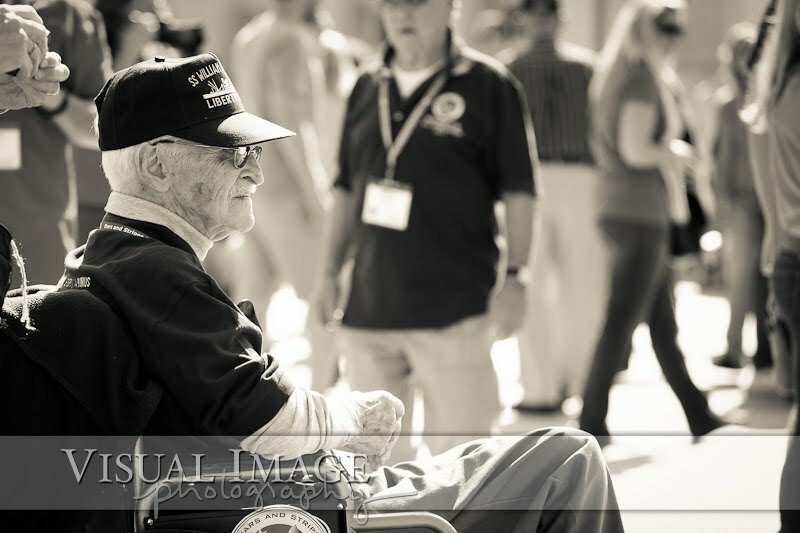 Extraordinary images of extraordinary men and women. 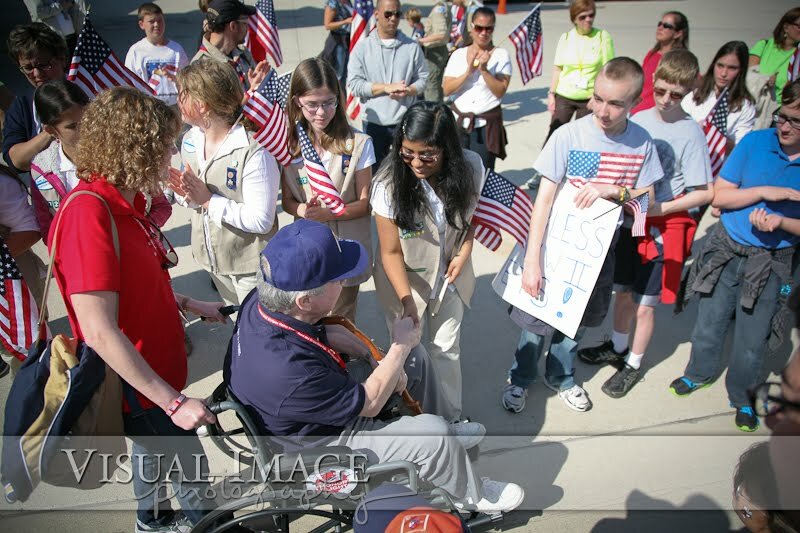 They tell the story well for those who were there and those like me who have only followed this WONDERFUL project of the Stars and Stripes Honor Flights. 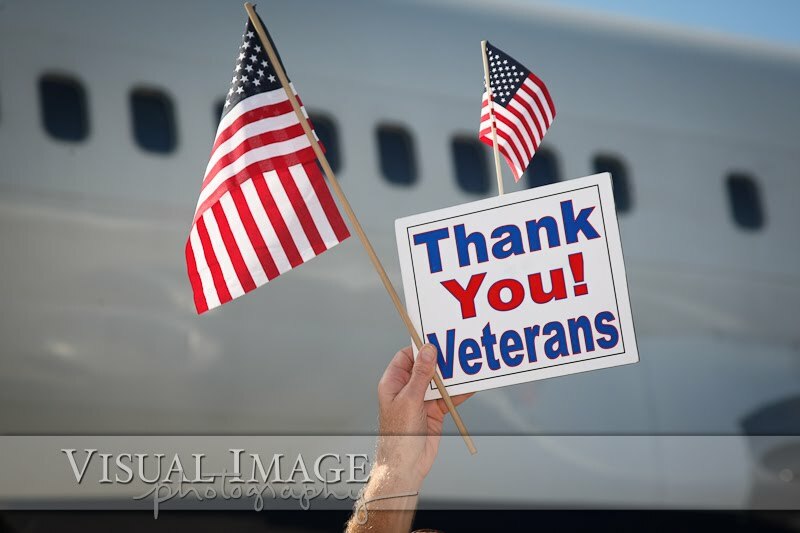 It does my heart good to see so many fine Americans who care about this great country and the people who make difficult choices to defend Her Liberties. 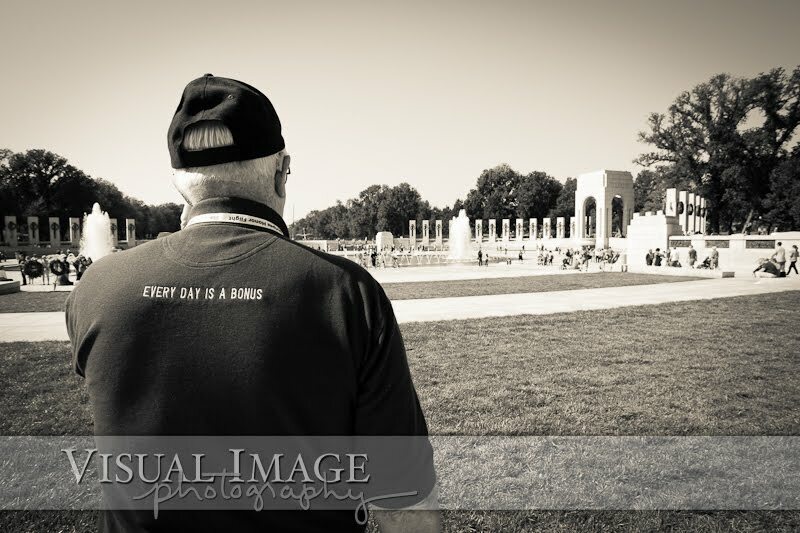 To remember is to honor.